The OutDoor Show finished on Sunday and there were not really much news. It was interesting to meet all the new people behind the companies and meeting good old friends and talk with them about new gear and ideas. But it was also a pleasure to take an out time during the fair to go paddling on the Argen with Q. Now it is time to show you some of the news in detail. Terra Nova was the first company who conquered the market with Cuben Fiber in 2010. Now they are back in 2011 with a new tent and an improved processing. Ok it is not a complete new tent. 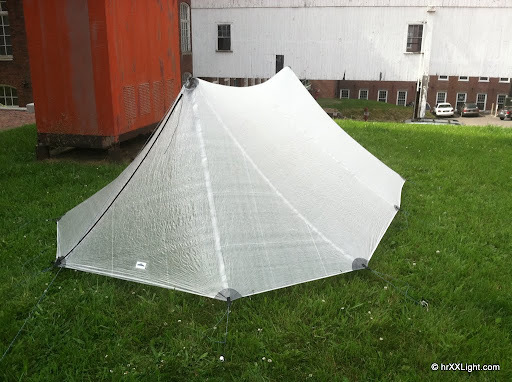 They used an existing tent and changend some Silnylon parts against Cuben. Voyager Ultra 2 is the name of the new two person Cuben tent. It is 50% lighter than the standard Voyager tent and has a maximum stability for a minimum weight. The Voyager Ultra 2 has a flysheet made with Cuben Fiber. Even the floor is made with Cuben. This is in my opinion not the best solution, because Cuben is not really abrasion resistent and you need a footprint when you don’t wanna gestroy the floor. It has a weight of 880g. Over the last year they were able to improve the processing. Last year the seams of the TN Laser Ultra were completly sewn, now they are glued. Finally I would say Terra Nova is on the right way to design ultralight Cuben tents. They learn from year to year how to work with the fabric. Let’s see what we can exspect next year. Mountain Hardwear introduced also a lightweight tent at the OutDoor Show. It is a 4-person tent with the name Hoopla 4. The tent has a height of 127 cm and a diameter of 292cm and weighs 738g. You can use one trailpole to pitch it. On top of the tent Mountain Hardwear uses a Trussring to get mor space. The design is very interesting and the space is superb. Perfect for longer trips with packraft. Easton is also back with the same, but lighter tent. Kilo 1P was the name of the tent which they presented last year and it weighed less than one kilo. The Kilo was revised during the year and has now a faantastic weight of 846g. For those who like more space there is the Easton Kilo 2P with a weight of 997g and the Easton Kilo 3P with a weight of 1,4kg available. For those who like superb tents from Sweden please have a look at Hilleberg. They introduced three new tents. The Anjan 2, Anjan 3 and the Rogen. For more details please click here. Not lightweight but a crazy project from Germany. Heimplanet is the name of this group of young entrepreneurs. The presented their new tent the Cave. It is a tent without any poles. Instead of poles they only use small tubes which are filled with air. Tge tent has a geodetic form and offers space for three people. You can inflate the Cave within one minute and is really stable. Only the weight of round about 5,3kg is not acceptable for hiking, but is a really crazy project and I hope they can reduce the weight in the next time. Last but not least another photo of an interesting tent. I found it at the Hyperlite Mountain Gear blog. It is made for cycling, packrafting and hiking trips and offers enough space for three persons. You can pitch the tent with your 4 piece paddles, trailpoles and even with the bike. The tent will be presented at the OutDoor Retailer Show ins the USA next week. At the moment the HMG prototype weighs 25oz. This is a very interesting post. Good to see Mountain Hardwear getting back into proper kit – lately it’s all been a bit North Face (aimed at mainstream and fashionable). Also glad to see Hilleberg moving with the times a bit more – when you have a few legendary tents, it’s easy to sit back and just keep making them. Whilst it’s good to maintain a design that is working well (if it ain’t broke, don’t fix it) but designs and innovation progress and Hilleberg have been a bit stagnant in the last few years. Always liked Easton stuff for my mountain bike – didn’t know they made tents too. They look quite interesting. Everyone seems to have sub 900g 1 person tents with lots of space these days. It’s an exciting year for shelters I think – we’ll see how many of them are (a) comfortable and (b) stable in rough weather. Great posts – thank you.